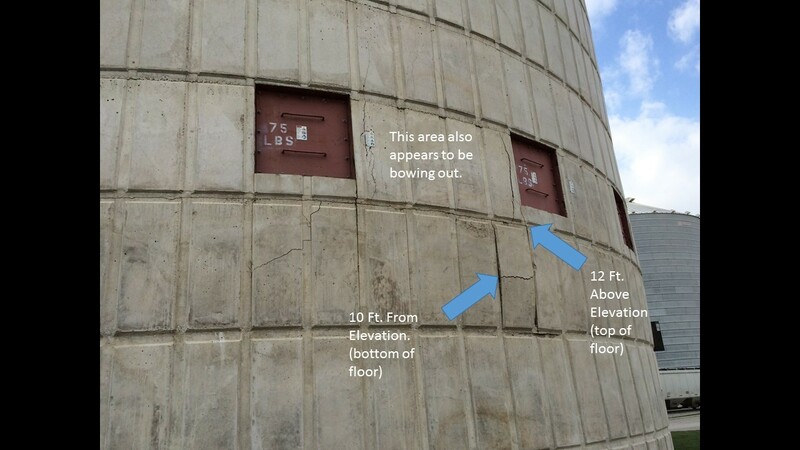 Former grain silo with wall failure after industrial use. This former grain silo was used for industry without prior inspection or reinforcement. As a result, horizontal and vertical cracking of significant size led to compromised structural security. Initial, light weight designs of grain silos cannot handle the pressure difference seen in industrial applications. In this situation, a collar wall was added to restore structural integrity of the existing silo wall. All penetrations pictured had fabricated steel extensions welded to the existing steel to protrude out to the new silo wall thickness. Dowels were anchored into the existing wall and additional rebar was placed prior to pouring the concrete. The new collar wall extended from grade level to 40’ up the silo. It reinforced the area of damage and enhanced structural integrity to meet requirements for the existing application and prevent future issue. Initial design in any new construction project is imperative. To ensure the longevity of your bulk storage system, it is very important to choose a company and engineering firm with experience and avoid basing decisions solely on price. Regular silo inspection is recommended to ensure structural integrity, operability and safety. The issue shown here could have been prevented prior to construction. While the cracking was severe, a thorough inspection by Marietta Silos allowed us to reverse the damage before a failure could occur.